Racelle leading a discussion at the inaugural Muslim and Jewish Women Leadership Conference, hosted by the DI and Sisterhood of Salaam Shalom this past November. The past few months have brought several significant staff transitions at the Dialogue Institute and the Journal of Ecumenical Studies. Racelle Weiman left her position as Director for Global Education and Program Development at the end of February, having first joined the staff in 2006. She served as Executive Director from 2006 to 2009 before moving to her most recent role. 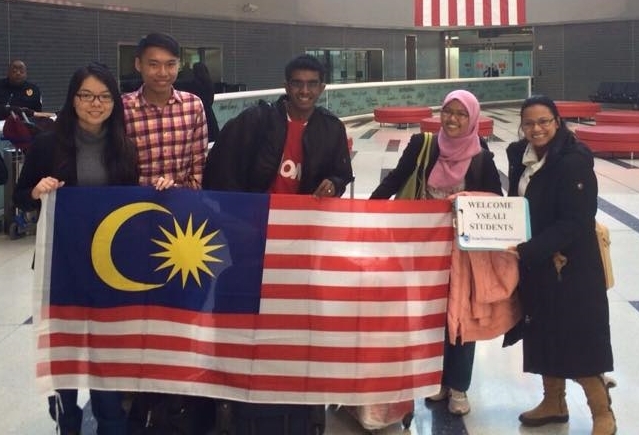 Meliani, pictured far right, welcoming SUSI/YSEALI students arriving in Philadelphia this past January. Racelle's knowledge of the myriad ways in which minority/majority relations balance power is well grounded in her astute observations of culture in the many countries where she has taught. This knowledge and wisdom joined with Leonard Swidler (her M.A. and Ph.D advisor) to organize, among other efforts, international “trialogues" intended to improve Jewish- Muslim-Christian relations. Racelle's passion for recognizing those who do support minority populations will carry on through her recently founded, "The Humanization Project." The first initiative is a documentary called Indonesian Lullaby: Courage and Compassion in a Time of Hate. Click here to learn more. Meliani Murtiningsih left the DI and the Journal of Ecumenical Studies at the end of March. She began as an Editorial Assistant for the Journal in 2010 and as Program Associate for the DI beginning in 2011. Devoted to her native Indonesian culture, Yeni came to the United States to study at Hartford Seminary and then to work for the DI with an intense passion for creating peace among Christians and Muslims. Beyond her editorial responsibilities at J.E.S., her work with the DI focused primarily on our bi-annual Study of the U.S. Institutes (SUSI) program. In addition to accompanying students through most of the five-week programs, Yeni provided strong leadership in handling much of the program logistics and administration, and also led sessions introducing our students to religious pluralism in America. Her sensitivity to their concerns made her our cultural ambassador, helping to interpret for students many of their most challenging questions and to draw them into the skills of dialogue and their plans for action. Yeni has returned home to Indonesia to be with her family, and is currently considering options to further her education. Tim Emmett-Rardin joined the DI staff this past November as the part-time Development Manager, focused primarily on grant writing. He moved into an expanded role as Director of Marketing and Development in February. Tim has worked in a variety of nonprofit, religious (including interfaith), and higher education contexts over the past 20-plus years. He received his M.Div. from Drew Theological School in 2004 (with a focus on interfaith studies/world religions, urban ministry, and social activism), and his B.A. in English and Communication from the University of Michigan in 1994. He lives in West Philadelphia with his partner, Amy, and their five-year-old son, Gabriel. Tim can be reached at ter@dialogueinstitute.org. The staff and Board of Directors are extremely grateful to both Racelle and Yeni for their time, their leadership and their giftedness in support of the DI/J.E.S. mission. Click here to make a donation in honor of Racelle and/or Yeni (and/or long-time staff member Julia Sheetz-Willard, who left this past November to begin a new position as Assistant Director of Campus Ministry for Ecumenical and Interfaith Outreach at Villanova University).